We are a retired couple (originally from Long Island, New York) living full-time in our 5th Wheel RV since July 2013. We are headed to Alaska from June to September 2015 with a caravan of 20 rigs from a camping club called SMART (Special Military Active Recreational Travelers). This is a group of active and former military personnel from all across the U.S. who have come together to travel through Alaska for three months. We have arrived in Great Falls, MT, and are preparing for our trip. Preparations are underway to get our truck and rig ready then we will meet the members of our Alaskan Caravan on June 14, 2015. After spending the last two weeks reading everyone’s email about where they are, we have all converged at Great Falls, Montana. There is quite an interesting mix in our group. The caravan will include 7 fifth wheels, 14 motor homes, and one Class C. There are 25 former military personnel in our caravan of 22 rigs/44 people: 9 Army, 8 Air Force, 4 Navy, 3 Marine Corps, and 1 Coast Guard. There are also about 30 something animals accompanying us – dogs, cats, and even a parrot. Orientation was held on Sunday where we met one another; most of us for the first time. The Wagon Masters are Nita & Phil and the Tail Gunners are Tom & Sandy. We have been given a load of information with a well-planned itinerary that will see us moving 27 times in 79 days. The trip sounds so exciting and we can’t wait to get started. Tomorrow we head north to Alaska! Roll call was by radio at 0730 hours starting with Reveille then each rig calling in their number (we are SMART 15). One couple had to drop out of the caravan already. While shopping for supplies for their Alaska trip, the wife fell and broke her arm. The doctor said it was the worst break he had seen in all his twenty-something years of medical practice. The wife had surgery today and they are hoping to join us afterward. We were assigned to group two for departure (there were five groups of three, five, five, five, and three). The groups were directed to depart 15 minutes apart so that we did not crowd the highways. In Canada, if you have five or more vehicles behind you and don’t pull over to let them pass, you could get a large fine. Don’t want to do that. The stop at the border was interesting. I had to go in to file paperwork to declare a shotgun in our possession. When the couple in front of me moved on, I walked up to the counter and gave the agent the paperwork. The agent was highly annoyed because I had just walked up. CANADIAN LESSON #1: Wait until called forward to the counter regardless of whether there is a sign telling you to wait or not. Today’s trip was 250 miles from Great Falls, Montana, to Fort McLeod, Alberta, Canada. It was 5-1/2 hours to get there. We were advised not to get into the campground before the Wagon Master and got a target time of 4 p.m. When we arrived at 2:30, we looked for something to do to kill time. There was a fort to look at so we parked on the road and spent two hours poking around the place. The fort was very interesting and worth the stop. At our travel meeting tonight, one of the other couples said they spotted a herd of about 200 buffalo shortly after crossing the border. Everyone said all they saw were cows and horses. He told us the buffalo were up on a hill and hard to see. It is possible that we thought they were cows so we ignored them. CANADIAN LESSON #2: Pay attention to ALL animals you see. The Fort McLeod Museum was quite interesting. They covered the history of the Royal Canadian Mounted Police (RCMP), and the early story of Indians, buffalo, and Canadian settlers. June 18 – Day Two. Today’s trip was 250 miles from Fort McLeod, Alberta, to Rocky Mountain House, Alberta. It was 6 hours travel time. We were in the very first group to pull out at 8 a.m. It was overcast, sometimes foggy, sometimes rainy, as we drove through flat, rolling farmland initially. South of Calgary more trees appeared and the terrain began to roll with small hills. This is definitely farmland and cattle ranch territory. Arrived at Riverview Campground around 2 p.m. after a six hours. The campground folks parked each rig personally. We parked the RV then drove into town to look at the Rocky Mountain House Museum. It had lots of antiques and stories about Canada’s history. Outside was an old Forestry Patrol Cabin used by the RCMP during rounds through the wilderness. There was also a one room schoolhouse built in 1907. The two buildings were moved there from other sites in town. We found out at the 7 p.m. travel meeting that the couple with the broken arm will not be joining the caravan. The wife had to go home for therapy after surgery. We also discovered that the couple who owned the parrot got turned around at the border. The rumor was that they didn’t have the proper paperwork for the bird. There is great concern about the avian flu in Canada. So much so that no one is supposed to be allowed across the border with raw poultry or eggs (doesn’t matter if it is frozen or not – it must be cooked). CANADIAN LESSON #3: Make sure you have all required paperwork for your pets. Day Three. We were assigned to group 4 leaving at 9 a.m. The drive was only 150 miles from Rocky Mountain House, Alberta, to Whitecourt, Alberta. The countryside became very wooded at times with pine, birch, and aspen. The weather started out partly cloudy and bright, then gradually got more overcast until thunderstorms erupted. We arrived at noon at the Whitecourt Lions Campground and were parked by the camp host personally. At 3 p.m. we took a tour of the Millar Western saw mill on the edge of town. Wow! We went in a group of 8 and were issued safety vests, helmets, glasses, and ear plugs. The noise was deafening and the floors vibrated as trees rolled along conveyer belts, were tossed around like match sticks, and automated saws reduced them to two-by-fours. The schedule called for pizza with the Mayor of Whitecourt at the local park, but it was cancelled because of the rain. The Wagon Master was able to have the Forest Interpretive Center (which happens to be located across the street from the campground) open for us to use their meeting room. After pizza, we were all able to look around the center. It is a small museum that explains the harvesting and processing of wood. There was also an interesting video about how paper, particle board, and fiber board are made. We discovered that the couple with the parrot who were turned away at the border have a bizarre story. It turned out that they would be able to enter Canada with the bird, but would have a problem coming out of Canada even though the bird was born and raised in the U.S. and they have paperwork to show it is their pet. They wound up driving back 80 miles to Helena, Montana, and after getting nowhere with four different, overlapping government agencies, wound up shipping the bird back home. They caught up with the caravan today. This center contains an interesting overview of the forestry industry - the harvesting and processing of trees into wood, chips, and sawdust. It is well worth a visit. This marker stands at the beginning of the 1,600 mile Alaska Highway. The highway was built in less than 9 months by the U.S. Army and civilian contractors. We drove to Kiskatinaw Bridge on the Old Alaska Highway. The bridge is listed on the historic register of engineering marvels along with the Panama Canal, the Egyptian Sphinx, and other worldly achievements. It is the only wooden trestle bridge left on the Alaska Highway that is still being used. The bridge was built with a curve and a nine degree bank in the roadway. The bridge took longer to build than the entire highway. We went to Bear Mountain Wind Park, about 10 miles outside of town. There were 34 wind turbine generators along the rim of the ridgeline. Each wind turbine weighs 236 tons, stands 256 feet tall, and produces enough energy to power 1,000 homes. We hiked a small portion of the trail but got turned back fairly quickly because of downed trees and overgrown roots (the trail is not maintained). The area had a kind of sci-fi feel to it. I guess it’s because of the immense size and quiet operation of the fans. At first, standing at the base of the giant fan and craning our necks up to the sky, you could barely hear the quiet whir of the engine turning the turbine. Then a thunderstorm rolled in, the wind picked up, and the fans started spinning faster. Now we could hear the blades as they spun past. Whoosh, whoosh, whoosh. Each blade weighs more than 7 tons and you could feel the power of them as they spun past. It was awesome. Saw two bears today about 45 miles south of Fort Nelson, BC. One was on the right side of the highway, about 15 feet off the road. The other was about 100 feet down the highway on the left hand side of the highway in front of the tree line. Seems like every day someone has a mechanical issue. Thankfully, they have all been able to take care of them without major difficulty. While driving from Dawson Creek to Fort Nelson, we noticed a cable dragging on the motor home in front of us. The three of us (two motor homes and a fifth wheel) parked on the shoulder on the road while the three guys took a look. It turned out that the quick disconnect on the brake line for the tow vehicle had come off. Fortunately, the driver was prepared and replaced the cable with another one he was carrying onboard. We were back on the road within 10 minutes. We drove 15 miles north of Liard River Hotsprings Lodge. It had a very steep trail down to the river's edge but the view was gorgeous. The falls were so raw and primal. The Sign Post Forest stands in a park adjacent to the visitor center. There is an incredible assortment of signs from around the world. People stuck all kinds of stuff on trees and posts – Frisbees, license plates, gold panning kits, shoes, Tupperware tops, engraved and etched plates, etc. We walked up and down the rows, marveling at the things people have posted over the years. It is estimated there are over 80,000 "signs" in the Sign Post Forest. We passed a herd of bison on the side of the Alaska Highway. There were two babies in the herd. Their fur color is very close to an orange. The bison graze right alongside the highway, seemingly oblivious to the passing traffic. The gorgeous scenery continues to roll by. The mountains rise in the distance, some with snow adorning their flanks. There are so many pine trees; it is easy to see why so many things are made out of pine. The roads have been pretty good, by and large, with few interruptions for road repairs or maintenance. The wildlife up here is precious and we all want to make sure they are protected for everyone to enjoy. One of our fellow caravan members told us a sad story. While driving on the Alaska Highway, he saw an animal laying on the road. Since it wasn’t moving, he assumed it was dead and continued in his lane. When he got about ten feet away, the animal popped its head up. Unfortunately, it was too late to move aside and he ran it over. CANADIAN LESSON #4: Always drive around an animal laying in the road. It may just be soaking up the warmth of the pavement and not roadkill. A group of us enjoyed a dinner at the Ribs & Salmon BBQ Restaurant. The food was outstanding and the company enjoyable. The group saw the Frantic Follies Vaudeville Revue. It was a very funny show with dancing, witty humor, songs, banjo playing, and awful jokes. One of the performers played a song on a deer antler in lieu of a drum. We were fortunate enough to be here on Canada Day. 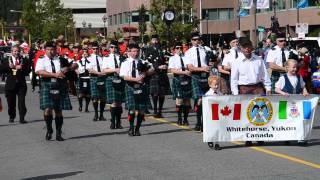 The parade kicked off with the Legion in the lead, followed by a bagpipe band, and then the Royal Canadian Mounted Police marching. The weather was sunny and clear with everyone having a great time. The kids waved flags, the residents wore shorts, sun dresses, and sandals, the tourists wore sweaters and jackets. Went to the Yukon Transportation Museum. Out in front is a full size DC-3 aircraft mounted on tall column that is perfectly balanced to allow the plane to turn with the slightest breeze. It is the world's largest weather vane. We drove from Whitehorse, Yukon, to Skagway, Alaska, today. The drive along the mountain roadways was breathtaking. The weather turned rainy and, at one point, you couldn’t see beyond the front of the truck with the fog and cloud cover. This was while trying to navigate a steep 11% descent into Alaska. White knuckle time! A stop along the drive from Whitehorse to Skagway at Emerald Lake (called Rainbow Lake by Yukoners). The beautiful color is caused by decomposed shell mixed with clay. Another stop along the drive from Whitehorse to Skagway, this time at Caribou Crossing Trading Post. This is such an interesting place. They have a petting zoo, husky puppies to hold and cuddle (bring money to buy treats for the dogs), and life size exhibits of wildlife. The wood bison was gigantic! There is also a café to get coffee and donuts as well as other goodies to eat. Bove Island on Tagish Lake along the Yukon Highway made a beautiful stop. The scenery is so lovely. The Yukon Suspension Bridge was a nice stop for lunch. There is a restaurant and gift shop there. The Tutshi River rushes far below the bridge and is that beautiful color of glacial rivers and lakes. One of the July 4th celebrations was an egg toss. It was the largest number of participants we have ever seen. There were hundreds of people lined over three blocks long. Slowly teams were disqualified as eggs broke. Soon they were down to 4 teams. First place went to a team from Portland, Oregon. Second and third prizes were split between the second, third, and fourth place winners. It was a lot of fun to watch! What a great way to celebrate our nation's independence than in small town America. Skagway has a population of 400-500 people. The cruise ships pull into port (sometimes as many as 4 at one time), and the campers pour into the campgrounds. The population swells to over 10,000 people on some days. We were invited to march in the parade. What an honor! We decorated two trucks, wore our finest red, white & blue attire, and joined the crowd. All staged and ready to go. It seemed like there were over a thousand people standing on the sidewalks waving and cheering as we went by. 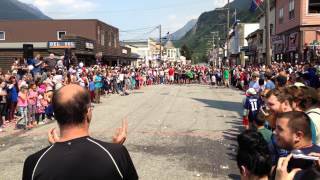 There were more people lined up on the walks than live in the entire town of Skagway! During our Fast Boat to Juneau ride, we saw humpback whales. A mother and calf came very close to another boat. After we arrived in Juneau on our fast boat ride, we took a bus tour to the Mendenhall Glacier. It was a huge ice glacier with a beautiful waterfall right next to it. I overheard someone telling a ranger he had been there 35 years ago and the glacier had been where they were standing. It turns out that the glacier is shrinking at the rate of approximately 12 feet per year. I'm glad we got to see it before it's gone. During our Fast Boat to Juneau ride, we saw this rookery of sea lions on the rocks. Most of the parents were already gone. The young sea lions came swimming over to the boat, barking and coming very close. I think someone has been feeding them. They were way too friendly for wild animals. We caught a catamaran from Skagway to Juneau. The ride was memorable along the rugged shoreline, snow dappled mountains, lush green forests, and emerald green waters. This is beautiful country! During our Fast Boat to Juneau ride, we spotted many eagles. The driver said there are more than one eagle per mile in the area - more than anywhere else in the world. We spotted this guy perched on a buoy looking for dinner. We have been here in Dawson City for 5 days. It is everything you would imagine a northwest town in the Yukon to look like. Only the main road is paved and that is with a very special light colored asphalt that has rubber in it to allow for movement. The rest of the roads in town are dirt and the sidewalks are all wood boards. Several buildings from the early 1900s are still standing and undergoing repair/renovations. This town is rich in history (and in gold!). About 65% of Dawson City has permafrost underneath. Permafrost is perpetually frozen ground all year long. When the settlers moved into the area, they built houses with stoves. The heat from the stoves radiated into the ground below causing the permafrost to start melting and turn into a muddy slush. As it melted, houses began to shift and sink. It is the reason they don't pave any of the roads here because the asphalt insulates and heats the ground. The Klondike gold rush of 1898-1900 centered around Dawson City. The tailings left from the diggings are piled along the roadside for miles before you even get into town. This place swelled from 400 people to 30,000 in the day. It must have been something to see. The mounties kept law and order so you didn't see the kind of lawlessness that you saw in the U.S.
We spotted an Arctic Fox just walking down the road while we were driving over the Top of the World Highway. What a pretty little face! The road from Dawson City in the Yukon to Chicken in Alaska is called the Top of the World Highway. It started with a ferry crossing of the Yukon River and included a wild ride through mountain roads that were paved, chip seal, unpaved, gravel, and dirt. There were potholes, wash board, maintenance activity, and all manner of road hazards to watch for. To make it more interesting, it was overcast and rainy making it difficult to see the road. Unfortunately, we couldn't see the views that were beyond the clouds. Don't take this road unless the weather is clear. We arrived in a small town at the end of the Top of the World Highway. There are 26 people living here in the summer; 4 in the winter. There were three distinct sections to the community – the campground we stayed at which had a gift store, clothing shop, and café; 2 other campgrounds; a tiny strip mall with 4 stores; and the old “downtown” Chicken where Fairbanks Exploration had conducted mining operations. There was an old schoolhouse that was featured in a book called “Tisha.” That book put Chicken on the map. All the buildings were dilapidated and falling apart. We stopped at Delta Junction where the Alaska Highway ended with 1422 miles of roadway built in 9 months. This was such an interesting and educational event. The tour guide was an educator and was able to explain the science of gold mining in easy to understand terms. There were also demonstrations of how the mining was conducted, making it so much more real as you envisioned what things must have been like back in 1900. We were even able to do a little gold panning ourselves. We took a tour on the Chena River aboard a sternwheeler. The boat stopped at a dog mushing ranch and a simulated traditional Eskimo fish camp. There were cabins and tents to explore, an informative talk about husky dogs, a fish wheel and smoke shed, and some reindeer to look at up close. This young woman was modeling an Eskimo parka for us. This was part of the Riverboat Discovery tour we took on the Chena River. It is made of wolverine and wolf fur. That parka has an estimated value of $18,000 to $20,000. We had the good fortune to be here when the WEIO was taking place. The crafts were fascinating and items for sale were one-of-a-kind. The athletic events were even more fascinating. The most interesting was the knuckle hop. This was meant to imitate a seal hopping across the ice. Our group went to the Denali Park Village for an Alaska dinner in a cabin-like setting. First, dinner was served family style where we sat 10 people to a table. Platters of food were brought to the table that we shared with one other. The meal included tossed salad, salmon, barbecue ribs, baked beans, corn, potatoes, rolls, and berry cobbler. After dinner, we were entertained with stories of early settlers and their hardships with comedic skits and songs that tugged at the heartstrings. Very enjoyable! It is surprising to see so many flowers in lush, full bloom. It is certainly one of the most unexpected sights in Alaska. They say it's the constant sunlight of summer. The most fascinating flower is the Fireweed. It blooms from the bottom up. When it reaches the top, that signals summer is over. Because of the very mild winter they had this year, the Fireweed began blooming early. The question is: Since the Fireweed began blooming early, does that mean summer will end early? Everyone is watching and waiting. We took a hike on the Horseshoe Lake Trail. The day was mostly cloudy. In fact, there is a 30% club here in the park. Only about 30% of the people who come here, get to see the peak of Mount McKinley. It is in the clouds 70% of the time. We have not seen it on this trip and according to the weather report, we won't. Oh, well. We will have to content ourselves with seeing all the other wonderful sights of this great park. Look at the reflection in this lake. You almost can't tell which way is up. This place in Anchorage has a great assortment of tasty treats and the largest chocolate waterfall I have ever seen. We took a trolley tour of Anchorage. Everyone who comes to this town should take the tour to learn about its history and see some of the sights. The bus driver narrated as he drove us around the area. We saw the largest float plane marina in the world, and earthquake park where the ground dropped off over 30 feet during the 1964 Good Friday earthquake. Drove past this place while touring historic downtown Homer. Very interesting. What do you do with your old buoys? This is one of the most beautiful spots I have ever seen. The mountains on the horizon, Kachemak Bay on one side, Cook Inlet on the other side, and the quaint buildings of this small town spread out on "the spit." A 13 year old boy designed the Alaska flag. Very interesting. A flock of common murres were nesting on a rock island. It was fascinating to watch them dive and swim. Their head and shoulders are black and lower body is white. We saw this pod of orcas feeding just outside of Resurrection Bay in Seward. They were very entertaining. We took a boat ride on Resurrection Bay. The view of mountains, glaciers, glacial waters, and wildlife were fantastic. Be sure to do this when you are in Seward! Puffins sitting in the rocks. The tour guide said it is rare to see puffins. They spend their lives out on the water and only come inland to nest. We were fortunate enough to see several nesting on a big rock island. Our group took the Kenai Fjords Tour into Resurrection Bay and Fox Island where we had a delicious dinner. The ship was very nice. Here are Barry & Betty Kellison enjoying the ride. Our Kenai Fjords tour stopped at Fox Island for dinner. Al Isabella, Jim Collier, and Gary Schneider skip rocks on the bay after our buffet dinner. The national parks service includes Fox Island in the Kenai Fjords National Park and Fox Island has world class skipping rocks. It was fun. We took a Kenai Fjords Tour in Resurrection Bay. One of the stops was at the Aialik Glacier. It was half a mile wide and over 430 feet high. It is a mile deep in some places. We sat for half an hour simply watching this fascinating ice flow as it groaned and cracked and broke off pieces of ice into the bay. Trisha McCord, Paul and I rented kayaks and took a tour of Tonsina Point and the shoreline of Resurrection Bay. The weather was perfect! This sign was standing in a state park where we hiked the Tonsina Point trail. Very different from warnings found in other places around the U.S.
We were driving down the highway when we noticed a large wave sweeping into the bay with three paddle boards riding the wave. The Turnagain Arm (where this inlet enters) has tide differences of 32 feet. A group of us pulled over to watch the wave slowly sweep into the bay and carry the paddle boarders miles inland. Al and Sandy Isabella enjoy lunch on top of Alyeska Mountain. The tram rose over 2,000 feet above Anchorage, providing a gorgeous view of the town, glaciers, and Turnagain Arm. Wagon Master Nita Taylor finally finds a moose, up close and personal. lol. She also saw wood bison, elk, wolf pup, great horned owl, eagle, red fox, and deer. Lake Hood is home to the largest seabase in the world. We had lunch on the patio of the Fancy Moose Lounge while we watched a constant flow of seaplanes and float planes come and go on the lake. We learned that before a float plane can lift off, it must tip one wing to break the suction of the water. At one time, there were more planes registered in Anchorage than cars. One couple has had to leave the caravan. An aunt is sick and they had to return home to take care of her. That makes the second couple who had to leave our group. Too bad. Although somewhat small, this was an interesting stop. There were several planes on display and stories of brave souls who pioneered Alaska. An outside display included an airliner we were able to climb aboard. The top from the original control tower was open for exploration. The museum sits right on Lake Hood, the largest seabase in the world. The zoo had many animals from cold weather climates, not just from Alaska. There were yaks, musk oxen, bactrian camels, polar bears, brown bears, foxes, wolves, moose, coyotes, porcupines, goats, sheep, owls, ravens, eagles, hawks, and more. The larger animals were in large size enclosures similar to their natural habitat. The center has a fascinating display of the history of the Alaskan native peoples. There are indoor exhibits and outdoor replicas of living areas. I was surprised to see so many underground homes. There was a demonstration of native dance that we especially enjoyed. This place is a definite must see. We learned that another member of the caravan has dropped out. This is the third rig to leave. The group is dwindling. Spied this moose on the side of the road when we traveled from Glacier View to Valdez, Alaska. She was happily munching on grass in the pond until we disturbed her. Locals say that when the fireweed reaches the top of the stalk, snow is only six weeks away. We are starting to see fireweed go to seed so I think it's about time to start heading back south. Brrrrrrrrrr. The caravan took a tour of the Columbia Glacier on Prince William Sound. The glacier started receding in 1984 and has retreated 13 miles in the 31 years since. We saw it calf an ice berg the size of a bus. The water was full of ice floes and ice bergs. Sounds ranged from popping ice in the water to the sound of thunderclaps from the glacier. It was very exciting. Note the sea lions lounging on the ice. We hiked the John Hunter Memorial Trail into the Chugach Mountains up to the Copper Valley Reservoir. Valdez has been called the Little Switzerland of the U.S. It is easy to see why. We hiked up to Worthington Glacier. The glacier has been retreating for 150 years yet still seems so big. There was an ice cave that we stood inside of briefly. The water was dripping and running off the glacier in flowing rivulets. So much water was running off that it formed a rushing torrent headed down the mountain. It was kind of cool to put my hand in the water and know I was the first person to touch it as it went on to become part of the rivers and oceans of the world. We hiked the Trail of '98. This trail was followed by the early gold miners (stampeders) on their way through Thompson Pass. We counted 17 glaciers from where we stood. We have seen more glaciers in Alaska than we saw in Glacier National Park. Our host at Destruction Bay RV Lodge arranged for a class by Duley of B.O.A.L.S. Duley creates beautiful wood items from diamond willow. He instructed us on how to make a walking stick. It was fun to whittle our sticks and chat about the Yukon. We stayed at the Destruction Bay RV Lodge in the Yukon. What a great stop! The owner, Loren Maluomo, couldn't have been nicer nor gone out of his way more to make our trip memorable. He cooked dinner for us both nights we were there. Here he is entertaining us with song while accompanied by Tim Naylor and Clint Watson, two well-known artists in the area. While driving from Destruction Bay to Teslin, this trumpeter swan came flying down the road in the opposite lane of traffic. He was beautiful. This museum was about a native American who spent his days photographing life around the Yukon. George Johnston was a very colorful character. He bought a car because he wanted one, even though there was no road paved in his home town. He drove through the woods and over the ice, giving locals rides for a dollar. While driving from Watson Lake, YT, to Dease Lake, BC, we passed this place. Jade City, as it turns out, is not an actual town but stores that sell every kind of jade imaginable. There are beautiful carved jade items, rough hewn jade items, and unprocessed jade rocks. Large saws stand beside huge boulders, hinting at how the stones have been taken from their original, gigantic rock form to the tiny trinkets and jewelry for sale in the shop. We drove the Teleghraph Creek Road up into the mountains. The drive was on narrow, winding, steep, unpaved roadway for miles. The views were breathtaking. There is a raised wooden walkway over a creek where the salmon come in to spawn. There were fish bodies everywhere - dead, dying, and spawning. It smelled. There were gulls screaming at each other as they pecked at salmon bodies. A black bear idly walked up and down the creek selecting the best fish for his dinner. We watched him for about 20 minutes before he disappeared from view. The walkway is controlled by the U.S. Forest Service. Since you can't get to Hyder unless you come from Stewart, BC, make sure you bring your passport with you. We drove up a narrow, winding, steep, unpaved road about 20 km to an overview of the Salmon Glacier. As we stood there looking out at the mountains around us, it felt like we were on top of the world. Almost every mountain peak around us had a glacier on it. We looked down on the Salmon Glacier which was miles wide and flowing like a river. It came straight at us then made a sharp right turn. Clouds drifted below and above us. The glacier was about 500 feet below us. We even spotted a marmot sitting on a rock outcropping watching us. It was exciting. We took a tour of the North Pacific Cannery today. Unfortunately, it rained the whole time but a hardy bunch were we. We donned our rain jackets and goloshes and traipsed around the facility. It is no longer an actively working cannery, but a good part of the operation has been left in place for us to imagine how things used to be. There were quarters for Chinese, Japanese-Canadians, First Peoples, and Europeans. Although the work was highly segregated, they worked as a fine oiled team. Quite interesting. Toured this historical village. There were several long houses that we were able to look at. Each house had a designated name and function. The Eagle House was the community hall. The Wolf House was where formal rituals took place. The Fireweed House was the treasure house where valuables were kept. There were many totem poles around the area. Some of the artifacts on display were very old. After 81 days, it was time to say good bye. The caravan presented the Wagon Masters, Tail Gunners, and Photographers with gifts of appreciation (from left to right: Don & Rebecca Sharp, Tom & Sandy Pearcy, Phil & Nita Taylor). This was followed by back slaps, hand shakes, bear hugs, kisses and tears with promises to keep in touch. Business cards, phone numbers, email and home addresses were shared with admonishments to "come on by and see us sometime." We saw fantastic scenery, thrilled to the closeness of wildlife, learned a hundred new ways to say "roadwork," and made lifetime friendships. All in all, it was a fabulous trip. It is time to retire our dogeared, well worn Milepost. This book was a great tool as we wandered around the Northwest Territories. It kept us on track driving over long distances with little more than trees and shrubs to find our location. We learned a great deal about Canada and Alaska as well. Caution: the Yellowhead Highway section does not have the same meticulous attention to detail that other routes have (landmarks not mentioned or misnamed), but it generally can guide you well enough. At the beginning of our trip, we marked all the places we would be stopping (we followed an itinerary). Each night before we traveled we would look over the planned route, note any areas to watch out for, plan for places to eat, and ensure we could navigate the campground at the end of the trip. The book was a little difficult to master at the beginning but it is well worth teaching yourself how to use it.